January was a devastating month for Canada's farm animals. There have been eight massive barn fires since January 1, killing almost 53,000 animals. Sadly, some of the simplest protection strategies recommended by farm and fire experts across the country are still not standard practice on Canadian farms. January was a devastating month for Canada's farm animals. There have been eight massive barn fires since January 1, killing almost 53,000 animals. Sadly, some of the simplest protection strategies recommended by farm and fire experts across the country are still not standard practice on Canadian farms. What's worse, the typical barn stores items that help fires to spread -- from large quantities of hay to industrial-grade chemicals and fuel. In some cases, the buildings themselves present a further fire risk due to compromised wiring or structures made of flammable materials, such as old wood. These tragedies don't need to happen. Despite the high risk of fire -- especially in the colder months when electrical circuits are taxed -- most barns do not have sprinkler systems or industrial-grade smoke or heat detectors installed, which would immediately alert owners to the presence of fire and potentially keep it under control until first responders arrive, saving both animal and human lives. Without this key prevention equipment, there is often nothing to be done once fire crews arrive on scene. Animals trapped inside an inferno can rarely be rescued. These tragedies don't need to happen. Precautionary measures prevent the majority of fires and help to control fires if they do break out. Pre-planning and fire drills, for animals and humans, are just as important as having the right equipment installed. Preparedness can help to speed response times and save lives when the worst happens. Protecting a barn from fire is an expensive but necessary proposition, as well as a moral obligation. It's one of the most important things that farmers can do for the protection of animals. 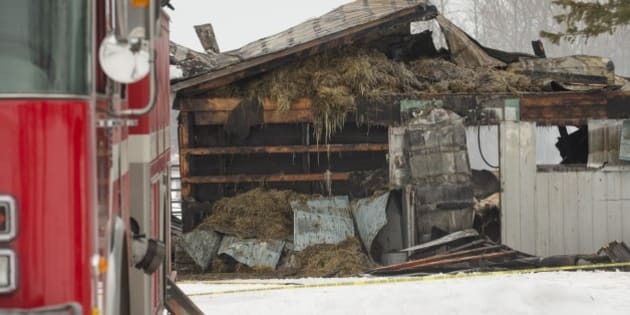 That is why we're calling on Canada's provincial and territorial governments to update their building and fire codes, requiring that all barns be outfitted with industrial-grade smoke and heat detectors as well as sprinkler systems. In Ontario, where the majority of this month's fires have taken place, the fire code is 20 years old. The requirements are out of date, as well as out of step with current farming practices, which include intensive confinement and crowded housing on larger-scale farms. The cost of prevention systems is high, but so too are the devastating losses we're hearing about this month. Even if fire happens once in a farmer's lifetime, the investment in a proper detection and fire control system will have been well worth it -- preventing loss of life, heartache and suffering.